Throughout March and April, the music department ensembles and students have traveled throughout the area performing and competing. 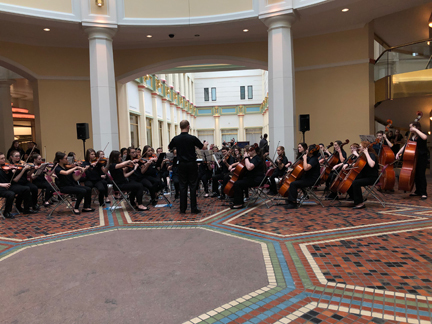 In early March, the high school and middle school choirs and orchestras each performed at the Harrisburg Capitol building for Music in our Schools Month. Following that the middle school Spotlight Strings and high school Chamber Orchestra and Chamber Choir performed in adjudications, all receiving the highest ratings of "superior." Beyond that two students traveled to Pittsburgh to perform in honor ensembles, Graham Rode for All-State Band and Eugene Lee for All-East Orchestra, also becoming the first Palmyra student to achieve that level. Congratulations to those students and ensembles for representing Palmyra with pride and success! Make sure to check the district calendar and attend some of the music concerts in May, they will all be excellent!